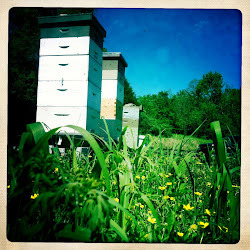 Economy hitting your beekeeping wallet?? Make your own drone frames! Let's face it. I'm a cheapskate. If I can save money in my beekeeping addiction I'm all for it. 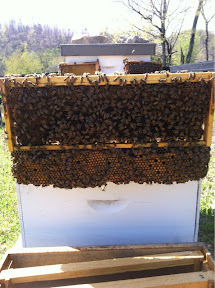 Here's one way...Instead if buying some fancy gizmo, take a medium frame and place it in a deep brood box. During swarm season, let the bees draw out drone cells along the bottom. Once the cells are capped, take the frame out and cut off the drone cells and replace the frame to let them do it again! This is an easy way without the use of chemicals to reduce the varroa population and help in swarm prevention. Varroa are more attracted to drone cells (especially in large cell bees) due to the higher level of juvenile growth hormone contained in the cells. 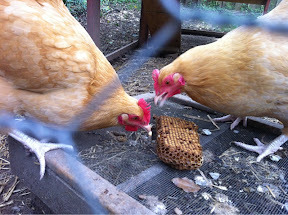 The best part is once you're done you can feed the comb to your chickens! It'll be like christmas for them. They'll love you forever. Try it sometime and tell me what you think. You'll have the most popular coup on the block! I feel now to start a honey farm. Your information is helpful. People like to take honey with natural medicinal herbs.